A pedestrian hybrid beacon, also known as a HAWK, was selected to address safety concerns relative to a mid-block crossing of a two-lane rural arterial connecting a proposed senior housing facility to a regional park. Traffic engineering challenges included an anticipated increase in the number of elderly pedestrians crossing a roadway with restricted sight distance, a 40-mph posted speed limit, and mid-range traffic volumes. A significant design challenge included the public’s lack of familiarity and understanding of how the newly-adopted standard device would work, given the unique balance the HAWK provides between the crossing controls of a full traffic signal with the more efficient operations of a no-green or ‘dark’ phase ideal in a mid-block setting. 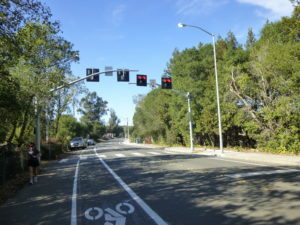 The plans prepared by W-Trans were included in the project construction drawings and resulted in the first HAWK installation in Northern California.